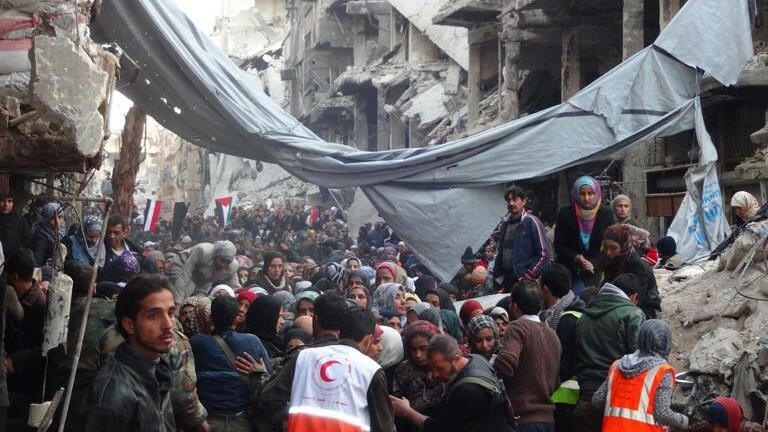 The UN Relief and Works Agency, UNRWA, is deeply concerned about the safety and security of civilians in the Palestine Refugee Camp of Yarmouk, Syria, and surrounding areas. All parties to the fighting should exercise maximum restraint to ensure that civilians are spared, and should take measures to prevent unnecessary damage to civilian infrastructure, said UN Spokesperson Stephane Dujarric at the daily briefing Thursday. UNRWA calls on all sides to allow civilians wishing to leave the areas of conflict to do so in safety and security. Medical cases should be allowed to be evacuated. It calls for safe access to distribute life-saving assistance, including food and medicine, to all civilians trapped inside Yarmouk and the neighboring areas. UNRWA estimates that there are up to 12,000 Palestine refugees in Yarmouk and the surrounding areas of Yalda, Babila and Beit Sahem. In the last few weeks, both checkpoints into Yarmouk camp have been closed for the majority of the time, cutting the last lifelines. Written by: KanelkaTagba on April 20, 2018. Posted by KanelkaTagba on Apr 20 2018. Filed under Headlines, World News. You can follow any responses to this entry through the RSS 2.0. Both comments and pings are currently closed.